There has been a church on the site though since the 12th century, long before the current layout of the Guildhall Yard was designed. 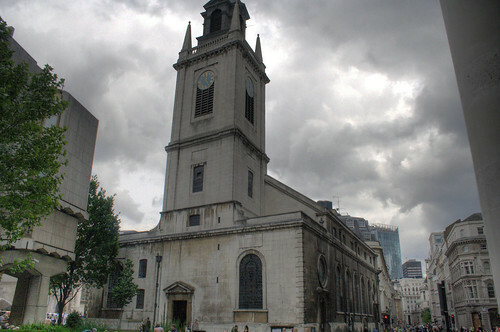 Sadly, that earlier church was wiped out in the Great Fire of London, but a replacement designed, you wont be surprised to learn, by Sir Christopher Wren was built on the charred remains. The name of the church comes from being both named after St Lawrence, but also from being based near a medieval Jewish ghetto. 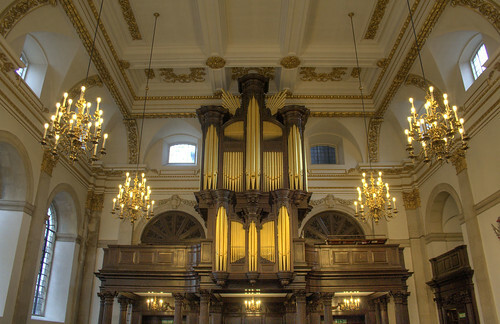 In 1618 the church was repaired and new windows installed – and then it burnt down in 1666. Rebuilt, it was seriously damaged in 1940 thanks to the fires from a German bomb. 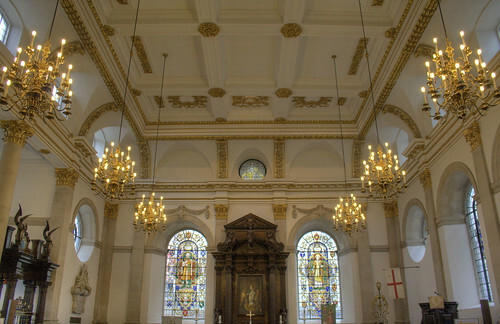 Restored again, it ceased to be a parish church and is now the official church of the City of London Corporation. Going in underneath the bell tower, and you enter into a wide bright open space with wooden altar at the far end. The church was described by Sir John Betjeman as “very municipal, very splendid” which seems fair enough. It’s not a heavily ornate in the style of Victorian Gothic, but the gilt gives it a pleasing glamour. The giant organ is behind you is actually modern, having been installed in 2001 to replace a rather inferior model installed just 40 years earlier during the post-war restoration. The church is open from 8am to 6pm, Monday to Friday.